LAR's NitriTox® toxicity analyzer is an advance-warning system containing an integrated and self-regenerating nitrifying bacteria culture. This patented and continuously working method allows the determination of toxic events to water within 5 minutes at any time. For one measuring point, continuous measurement for monitoring and control. 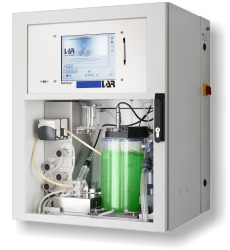 Analyzer for rapid continuous determination of the toxicity of drinking water, surface water and waste water with nitrifiying bacteria (nitrosomonas/nitrobacter) for wastewater management and process control. Detection of toxic incidents, documentation and alarm. Consisting of fermenter for constant growth and activity of nitrifiying bacteria, self- cleaning measuring vessel with optical oxygen electrode for monitoring the respitation activity during the test, 3 peristaltic pumps for defined supply of sample, the nutrient solution, the dilution water and for the bacteria circulation. Control/ evaluation unit with industrial PC, menu- driven, self- explaining software with integrated help files, plausibility check, splash-protected keypad, 10.4 -inch Graphic LCD touchscreen, presentation of the actual measuring values in table form, displaying of the calibration values, daily protocols, data storage for one year. Memory card with the operation software for an automatic start up of the system in case of power interruption or discontinuous usage. The FlowSampler is used for filtration-free sample preparation for continuous measurement systems by mass separation, a free maintenance and a blockage-free device. The sample will be led through the FlowSampler and drawn off through a thin-walled pipe against the direction of the mainflow. Homogenizer for continuously homogenisation of the sample depending on the measurement cycle of the QuickTOC.